This study represents a model for teachers across disciplines to use the teaching of writing for students to access, explore, and articulate possibilities for their future selves in connection to science. More specifically, this project offers a means for teachers of writing to support their students in studying high-achieving women working in science-related careers as a step toward narrowing the gender divide in the sciences and to practice writing as a real-world, transferable skill with meaningful purpose (Bystydzienski & Bird, 2006; Early & DeCosta, 2012). 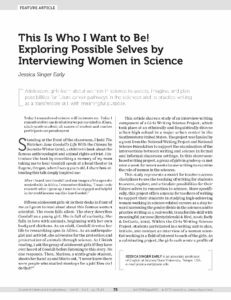 Within the Girls Writing Science Project, students participated in a writing unit to plan, initiate, and conduct an interview of a woman scientist working in a field of interest to each of the girls. As a culminating project, the girls each wrote a profile of a woman scientist to share what they learned and how they were impacted by this work. Through communication with and writing about women mentors, this literacy community had an opportunity to imagine future pathways in relation to science. Early, J.S. (2017). This Is Who I Want to Be! Exploring Possible Selves by Interviewing Women in Science. Journal of Adolescent & Adult Literacy, 61(1), 75–83. doi: 10.1002/jaal.635 ©2017 International Literacy Association.